These promotional personalized Yo-Yo's pronide an excellent advertising and promotional opportunity. For decades, people have enjoyed playing with Yo-Yos. These custom imprinted Yo-Yo's are used to do tricks, practice their moves, or just as a way to pass the time. 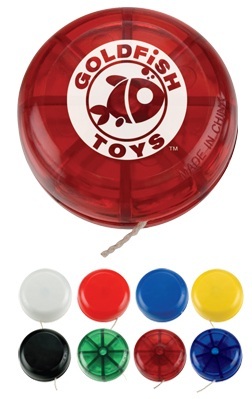 By giving people a customized Yo-Yo with your personalized message or LoGo, you are bringing them back to a happy time in their childhood that they will now associate with your brand. Give us a call (706-374-0710) for a FREE quote and to put our years of promotional and advertising experience to work for you. Production time is 5-7 working days after proof approval on all orders of 2000 pieces/passes or less.